Seattle Cascades broke up with Seattle Sockeye. After a couple of years of partnering with the elite men's club ultimate team in Seattle, the American Ultimate Disc League team has decided to operate independently. 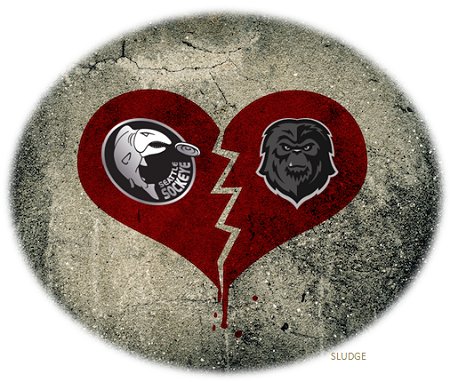 As partners, Sockeye and Cascades shared the same captains, coaching staff, and similar rosters. Throughout the entire season, [Cascades GM] Xtehn worked closely with the Sockeye leadership to plan and execute roster decisions, fitness planning, and on field practices. 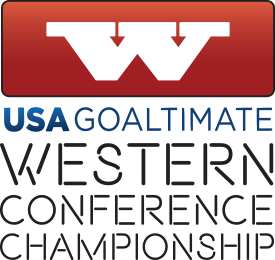 Seattle Cascades won the Western Conference Division in 2016 and finished 2nd to Dallas Roughnecks in the 2016 AUDL Championship. Meanwhile, Seattle Sockeye tied for 5th in USA Ultimate's Triple Crown Tour. Of the three signed players (Mark Burton, Khalif El-salaam, Adam Simon) for the 2017 AUDL season, only Burton played with Sockeye in 2016. 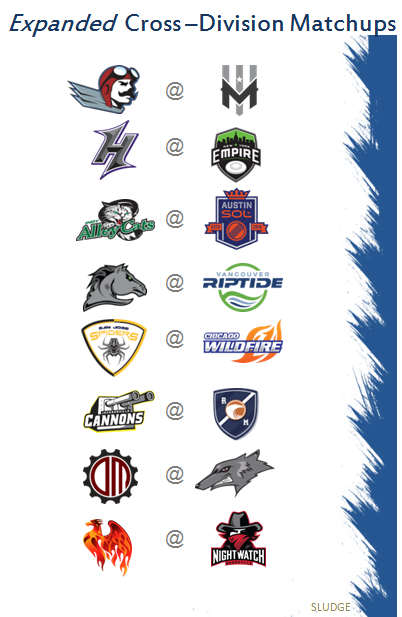 With the shutdown of the MLU, the Cascades have a larger talent pool to pull from including players from Seattle Rainmakers and, perhaps even, from the Portland Stags; in addition, to a wealth of Seattle-area club players from the mixed and women's divisions. 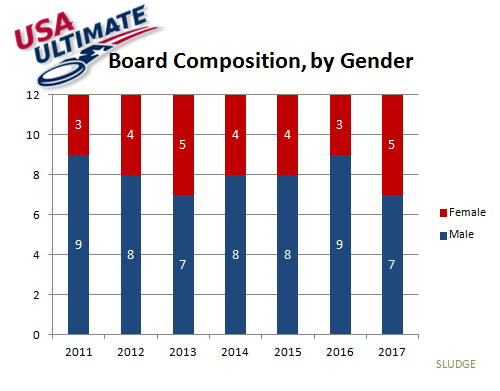 The makeup of the 2017 USA Ultimate Board of Directors is at a gender ratio like 2013 - 7:5 male to female. 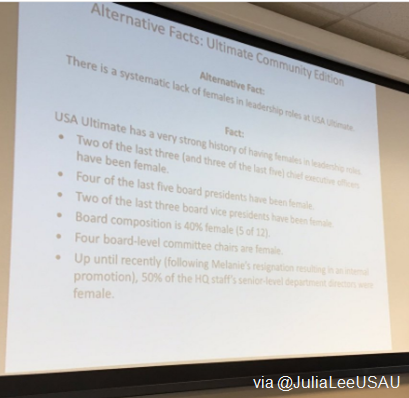 Last year (2016), the USAU Board was 9:3 male:female. Finally! 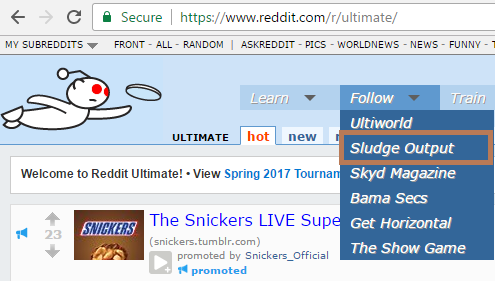 After 10 years and nearly 4000 posts related about ultimate, the Sludge Blog has been officially listed as a source to "Follow" within the subreddit r/ultimate. Thank you anyone and everyone who made this possible. One slide was shared via Twitter from the USA Ultimate Board of directors meeting this past weekend. The slide is titled: "Alternative Facts: Ultimate Community Edition." Fact: USA Ultimate has a very strong history of having females in leadership roles. RELATED: See history of USAU board composition by gender. Minnesota announced on January 27 that AUDL would assume responsibility operations for the Wind Chill team. Atlanta Hustle (AUDL South Division) were in a similar situation for the 2016 season. 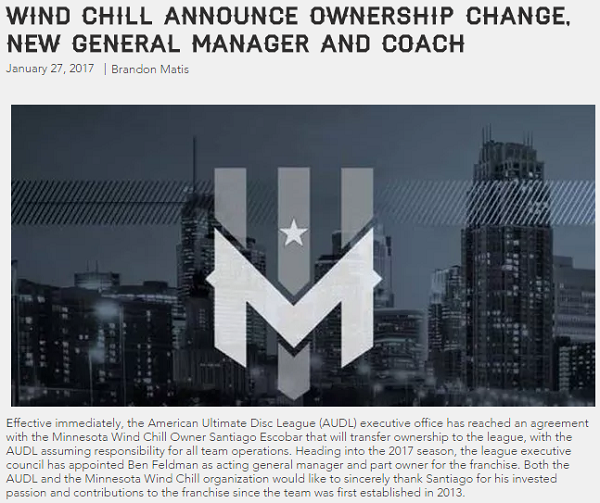 According to the announcement: "Effective immediately, the American Ultimate Disc League (AUDL) executive office has reached an agreement with the Minnesota Wind Chill Owner Santiago Escobar that will transfer ownership to the league, with the AUDL assuming responsibility for all team operations. Heading into the 2017 season, the league executive council has appointed Ben Feldman as acting general manager and part owner for the franchise. Both the AUDL and the Minnesota Wind Chill organization would like to sincerely thank Santiago for his invested passion and contributions to the franchise since the team was first established in 2013." Minnesota finished (9-5) in the 2016 season and lost inn the first round of the Midwest Division playoffs. Fulcrum Media covered the Women's Division at 2016 USA Ultimate National Championships (October 2016) and has produced scintillating highlights for each team in what they call, a "Sizzle Reel." Consider supporting Fulcrum's curated project: Equity Through Visibility. Boston Brute Squad | Sizzle Reel from FulcrumPro on Vimeo. Seattle Riot | Sizzle Reel | Part One from FulcrumPro on Vimeo. Denver Molly Brown | Sizzle Reel from FulcrumPro on Vimeo. San Francisco Fury | Sizzle Reel from FulcrumPro on Vimeo. Washington D.C. Scandal | Sizzle Reel from FulcrumPro on Vimeo. Vancouver Traffic | Sizzle Reel from FulcrumPro on Vimeo. Atlanta Ozone | Sizzle Reel from FulcrumPro on Vimeo. Madison Heist | Sizzle Reel from FulcrumPro on Vimeo. San Francisco Nightlock | Sizzle Reel from FulcrumPro on Vimeo. Texas Showdown | Sizzle Reel from FulcrumPro on Vimeo. Raleigh Phoenix | Sizzle Reel from FulcrumPro on Vimeo. Columbus Rival | Sizzle Reel from FulcrumPro on Vimeo. Quebec Iris | Sizzle Reel from FulcrumPro on Vimeo. San Diego Wildfire | Sizzle Reel from FulcrumPro on Vimeo. Green Means Go Sizzle from FulcrumPro on Vimeo. Portland Schwa | Sizzle Reel from FulcrumPro on Vimeo. 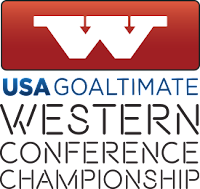 USA Ultimate announced the invite list to tryout for Team USA Ultimate to represent at The World Games 2017 in Poland. The sixty-four (64) invited players include the 2013 World Games team roster plus players from the WUGC 2016 tryout process. 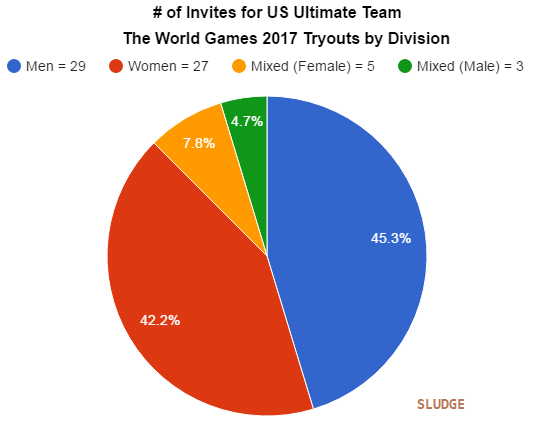 While the Flying Disc event (ultimate) is played as a coed competition, only 8 (12.5%) of invited players to tryout played in the mixed division. The mixed division invitees are: Erica Baken (Minneapolis Drag'n Thrust), Nancy Haskell (Cincinnati Steamboat), Raha Mozaffari (Philadelphia AMP), Sarah Anciaux (Minneapolis Drag'n Thrust), Sarah Meckstroth (Minneapolis Drag'n Thrust), Chris Mazur (Mianus Metro North), Khalif El-salaam (Seattle Mixtape), and Mac Taylor (San Francisco Blackbird). As reported by Evan Lepler [Tuesday Toss; January 17, 2017], Beau Kittredge will join the San Francisco FlameThrowers for the AUDL 2017 season. Beau is quoted as saying: "Last year, I tried to grow the sport with energy, money, and the all-important (Dallas Roughnecks owner) Jim [Gerencser] factor. This year, I will get paid the same as everyone else on the team. This year, I will try to grow the sport with just love, putting together a team of people who want to win, love the sport, and each other." His pro ultimate salary in 2016 was reportedly in the "ballpark" of $50,000 with the Dallas Roughnecks. His 2017 pay will probably be around $25-$75 per game for the FlameThrowers. Get ready for a 2-minute primer on the sport of ultimate frisbee. Don't think it's as easy as passing around a disc! Ultimate does not need refs. 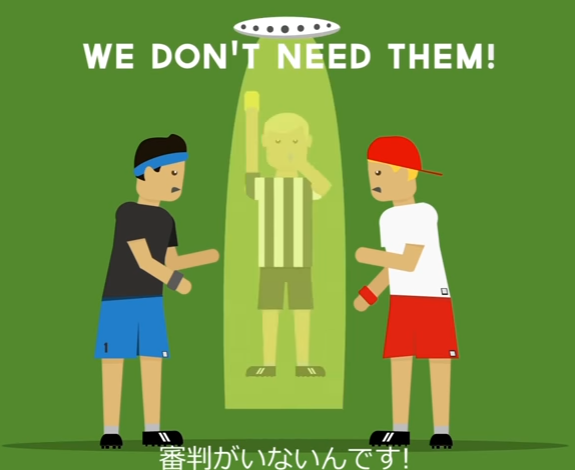 A flying disc (UFO) captures a referee. 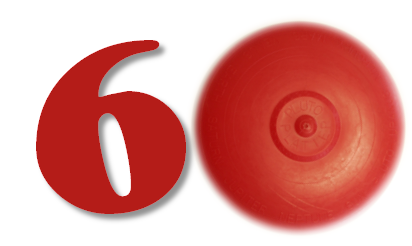 Today has been historically observed as the "Frisbee's Birthday" which would have happened 60 years ago. In reality, it can only be proven that sixty years ago on this day (January 23, 1957), "Wamo" acquired the exclusive rights to Fred Morrison's plastic flying saucer type toy. Morrison's first disc was the Flyin-Saucer (1948), and then later remolded into what was known as the Pluto Platter. Wham-O renamed the Pluto Platter plastic flying disc in 1958 as a "Frisbee"® which originated from New England college students tossing around empty tins from the Frisbie Pie Company. The truth: it's highly unlikely that "Wham-O toy company rolled out the first batch of their aerodynamic plastic discs" on the same day (January 23, 1957) it gained contractual rights to the plastic disc. 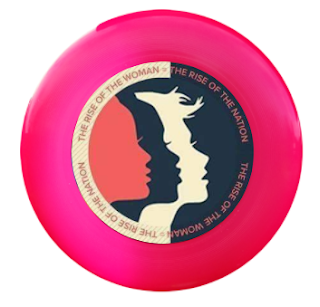 The Wham-O Frisbee was the disc of choice for ultimate players until 1991. What can be proven is today marks the anniversary of the agreement which made it possible for the Frisbee to be manufactured and widely distributed by Wham-O! A huge turnout participated in the Women's March on Washington and concurrent worldwide marches on Saturday, January 21. Below are a few demonstration moments captured by the ultimate community on and off the field. Shea Gunther, the coach of the Falmouth Middle School ultimate team (Rogue), was ice skating with on Great Pond in Cape Elizabeth, Maine, when he rolled his Frisbee on the ice. Watch the ultimate disc persistently stay on its edge as it glides into fakie switches. President Obama finishes his term as president today. After 8 years, he and his family have provided some memorable moments related to ultimate. January 2010: President Obama sent a congratulatory letter to members of the Team USA Ultimate for winning gold at The World Games 2009. May 2010: Mrs. Obama's "Let's Move" initiative targeting childhood obesity included the recommendation to play sports; specifically, throw a Frisbee around. 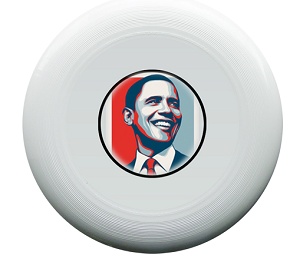 September 2012: While on the campaign trail, President Obama opened his speech with a story about ultimate Frisbee. April 2013: The Obama's backyard was involved in a local kerfuffle which impacted a D.C. pickup ultimate game. October 2015: Malia Obama gleefully posed with an ultimate disc during a college tour at Brown University. Throwback to the mid-1990's when the pocket-sized printed rules of ultimate was published by the UPA. 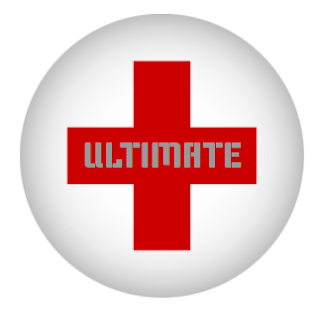 USA Ultimate is currently following the 11th edition rule set. The magenta-printed rule book describes ultimate as "a non-contact sport played by two seven player teams. The object of the game is to score goals. The disc may only be moved by passing as the thrower is not allowed to take any steps. Any time a pass is incomplete, intercepted, knocked-down, or contacts an out-of-bounds area, a turnover occurs, resulting in an immediate change of possession of the disc. A goal is scored when a player successfully passes the disc to a teammate in the endzone which that team is attacking." "The purpose of the rules of Ultimate is to provide a guideline which describes the way the game is played. It assumed that no Ultimate player will intentionally violate the rules; thus there are no harsh penalties for inadvertent infractions, but rather a method for resuming play in a manner which simulates what would most likely have occurred had there been no infraction. In Ultimate, an intentional foul would be considered cheating and a gross offense against the spirit of sportsmanship. Often a player is in a position where it is clearly to the player's advantage to foul or commit some violation, but that player is morally bound to abide by the rules. 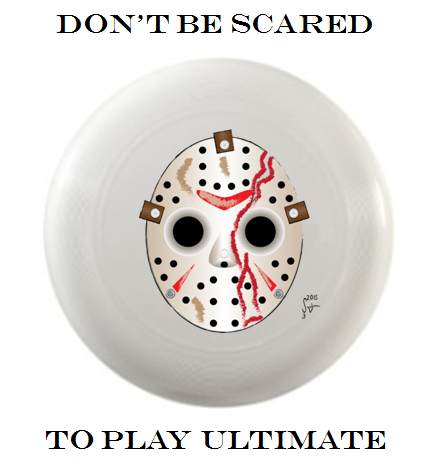 The integrity of Ultimate depends on each player's responsibility to uphold the spirit of the game, and this responsibility should not be taken lightly." No set of rules can replace player's respect for one another and for good spirit. 1. Each half lasts for twenty-four (24) minutes of stopped time. 2. A game to points lasts until one team scores twenty-one (21) goals with a margin of victory of at least two (2) goals. Observers are mentioned near the end of the rule book. "Before the game, the captains may decide to select up to six (6) experienced non-players to act as Observers. In this role, their job is to carefully watch the action of the game. They do not actively call any fouls, violations, picks, or line calls. through Sunday, August 27, 2017. 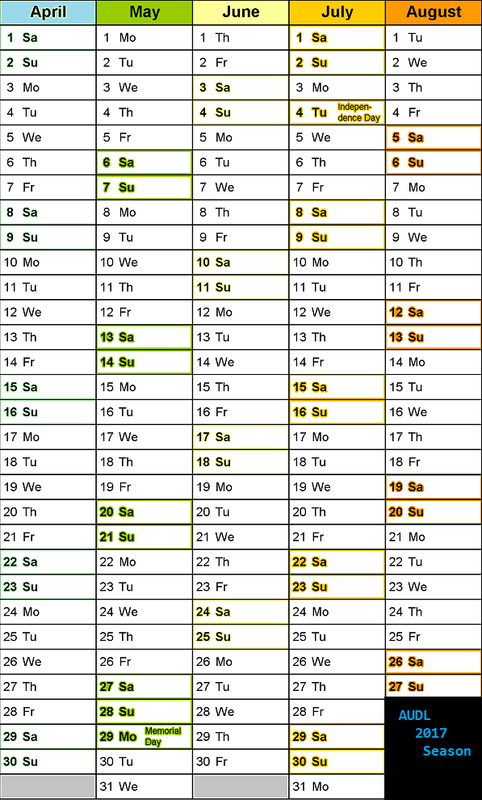 That amounts to a 149-day season (4 months + 27 days or 21 weeks + 2 days) from the first game in early April through late August at Championship Weekend. This 2017 season will be the earliest start for any AUDL season, and the 6th AUDL season will end later than any previous AUDL season. The 2017 AUDL season will be its longest in its history. Overall, the AUDL 2017 season will span over 40% (40.8%) of the calendar year. 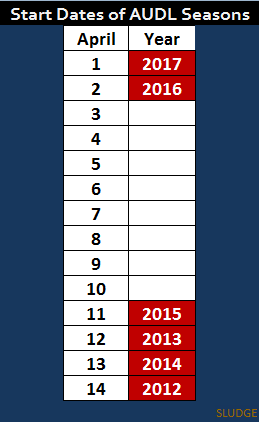 As a comparison, the 2016 NFL season (September 8 through February's Super Bowl LI) lasted 150 calendar days. The American Ultimate Disc League is starting early this year compared to past seasons. 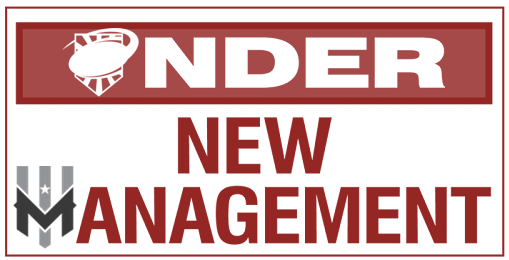 I had figured the AUDL 2016 season was also going to start on April 1st. 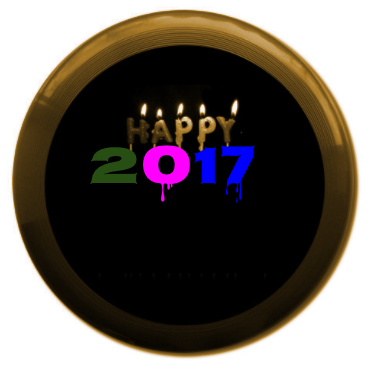 As predicted (see below), the 2017 American Ultimate Disc League season will begin on April 1, 2017. 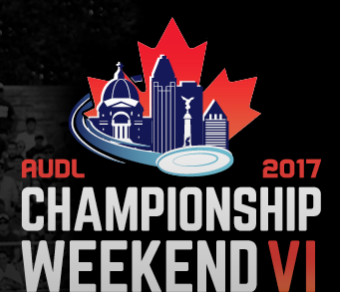 With the 2017 AUDL Championship scheduled for August 26-27, the 6th AUDL season will its longest season ever. 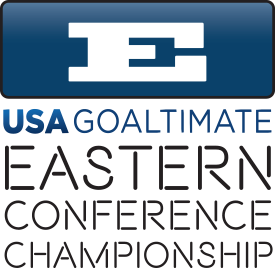 After its inaugural year, USA Goaltimate returns in 2017. 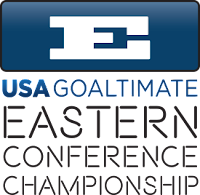 A Central Conference will debut in addition to the Eastern and Western Conferences. 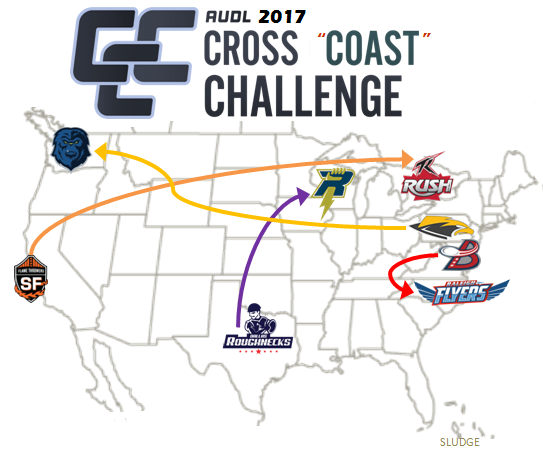 AUDL's cross-division games in the 2017 season are being billed as the "Cross Coast Challenge." However, if you look at a a map, I would argue that 4 teams are not considered "coastal" cities - Madison (Wisconsin), Dallas (Texas), Pittsburgh (Pennsylvania), Toronto (Ontario). The CCC is more alliterative than geographically correct. 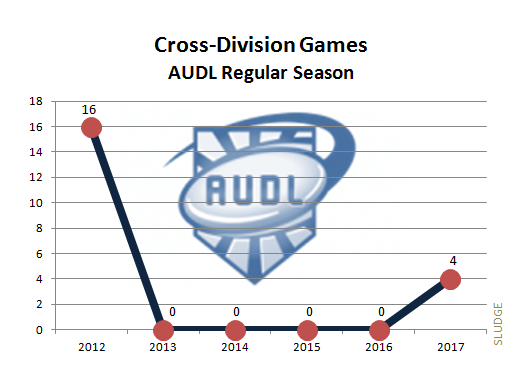 After 4 seasons without a game between different divisional teams in the regular season, American Ultimate Disc League just announced four cross-division games. The matchups include eight of the twelve teams that advanced to the 2016 postseason. NOTES: This is not intended to be list EVERY ultimate event this year, just some major ones. Will update as additional dates are published. Yet another dog and frisbee comic. "The Tourney" shows 2 teams huddling during an outdoor 5v5 ultimate tournament. The orange team looks over at the blue team and notices a bi-ped dog wearing a headband. 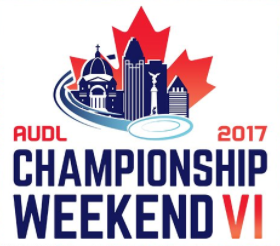 "Shoot - they brought a ringer"
The American Ultimate Disc League's Championship Weekend was already announced to be in Montreal, Quebec. The Facebook event page discloses the championship weekend logo. Fools Fest is here! Fools Fest is here!! WHAT: Fools Fest 2017 is the 40th Fools Fest. And as such it will be larger than ever. It will be special and amazing. It will be...XL. Where are the studies on the kinesiology of ultimate? One college student seeks answers to this question. 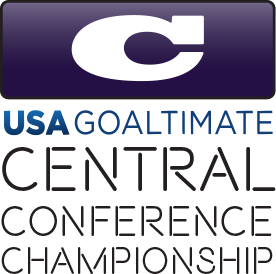 All ultimate teams from USAU club to high school and youth clubs are encouraged to participate. Survey goals: To determine the training standards and regimes instituted by individual programs when preparing players for competitive play. Also, curious to know what access, if any, players at different competition levels have to certified athletic trainers or other medical staff who specialize in athletic injury and kinesiology. 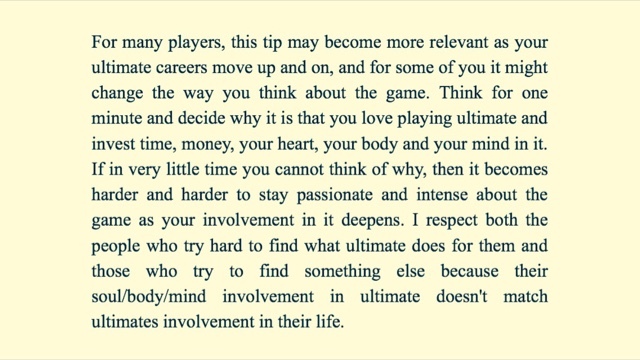 Ultimate Investment: Why Do You Play Ultimate? Today marks the beginning of the 2017 regular season of USA Ultimate's college ultimate. The regular season: run from January 1st through April 2nd. 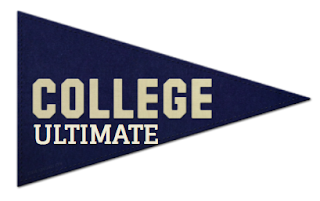 The first sanctioned college ultimate tournaments are Florida Winter Classic 2017 (women's division) on January 14 and Cola Classic 2017 (men's division) on the 21st of January. Wishing you an amazing 12 months on and off the ultimate field.